Continuing our sold-out collaboration of last year’s Stanford Jazz Festival, ICMA Foundation co-presents with Stanford Jazz, presenting jazz virtuoso George Brooks and Indian classical music star Mahesh Kale reunite for a performance that transcends cultural and musical barriers. Featuring renowned Indian percussionist Bickram Ghosh, this performance of otherworldly sounds creates an intriguing blend of jazz energy and Indian ragas and rhythms. As many of you may already know, ICMA's founder, Mahesh is a phenomenon around the world, beloved for his enchanting, soaring voice and his unique ability to interweave classical and popular music. Saxophonist George Brooks has a colossal tone, intuitive creative leaps, and a commanding technique. The go-to horn-master for blues giants like Etta James and Albert Collins, he helped to create the electrifying genre of Indian/jazz fusion with world-class virtuosi such as Zakir Hussain, John McLaughlin, and the late Larry Coryell. Together, Mahesh, George, Bickram, and their world-class rhythm section of bassist Kai Eckhardt and keyboardist Osam Ezzeldin, will conjure otherworldly sounds steeped in Indian ragas and rhythms, creating an intriguing blend of jazz energy and Indian traditions. San Francisco-based Indian vocalist and recipient of the National Film Award conferred by the President of India, Mahesh Kale, along with an elaborate ensemble of stellar instrumentalists from India, will take us on the musical adventure that has captured the hearts of audiences worldwide. Endearingly called the “unlikely rock star,” Kale has captivated audiences of all ages with his soulful performances that reflect an earnest reverence for the purity of the Indian classical music tradition while embracing experimentation, technology, and youthfulness. This is Kale’s first hometown feature concert since receiving the prestigious National Award. Click here for info. Jazz virtuoso George Brooks and Indian classical music visionary Mahesh Kale unite for a collaboration that transcends cultural and musical barriers. The performance will also feature South-Indian percussionist kanjira virtuoso V. Selvaganesh, German/Liberian electric bassist Kai Eckhardt, and Egyptian-born pianist Osam Ezzeldin. Click here for info. "Katyar Kaljat Ghusli" - First exclusive international screenings! Click here for more..
We're happy to help promote a wonderful upcoming concert featuring renowned Hindustani Sitar exponent Pt. Karthik Seshadri. South India Fine Arts (SIFA) will be presenting-- Sambandh: Jugalbandi with Pt. Karthik Seshadri on Sitar and Sri. U Rajesh on Mandolin. 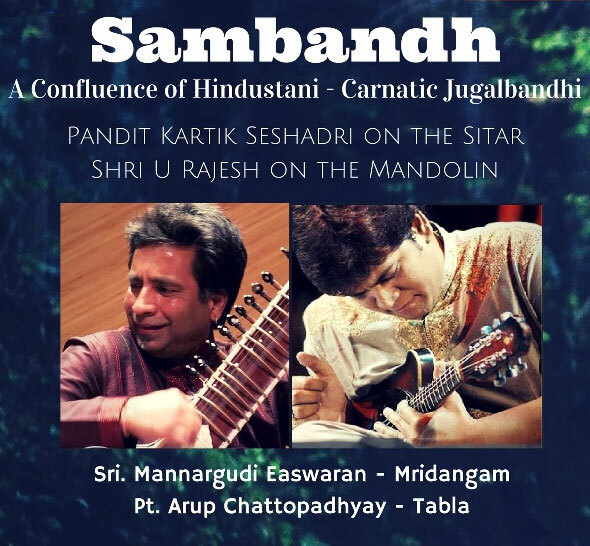 It's a unique opportunity to experience a confluence of the two pre-dominant streams of Indian Classical Music, North Indian (Hindustani) and South Indian (Carnatic), in a sitar-mandolin jugalbandi with highly acclaimed artists of our generation. Concert will be held on April 9th (Sat) at 4:30 pm at the Santa Clara Convention Center. For tickets, click here. The show that captured the hearts of South Bay audiences is back, this time, by the bay. In proud partnership with Asia Week SF 2015, we can't think of a more fitting festival for Melange's San Francisco debut to celebrate art, culture, and heritage at Asia Week SF. Click here for details. South India Fine Arts (SIFA) and ICMA Foundation collaborate to bring to you "Vayu Vandanam" on April 26th at 4 pm. World-renowned vocalist Pt. Jasraj will take us on a musical journey sure to stir the soul! Dr. Pt. Vidyadhar Vyas, who is a senior exponent of Gwalior Gharana - the fountainhead of the Gharana (schools of music) system of Khyal music, through his music and demonstration, will shed light on the different shades there are to this Gharana. Two Traditions. Three distinguished artists. One magical evening. 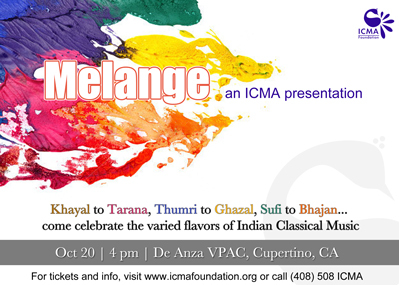 ICMA invites you to join us for a rare treat of Indian classical music – "Two Traditions" ...bound together by one soul! Dhrupad - a form of Nada Yoga (yoga of sound), is an ancient and disciplined style of presenting Raga, that is deeply rooted in the Vedas and transports you back to a timeless space, giving you a spiritual experience. Khayal - a more modern adaptation, finds greater scope for improvisation without detracting from the grammar of the Raga. It is this stark contrast and striking similarity of these two preeminent genres, that we at ICMA, wish to present to you in this unique two-part concert. Come join us to see first-hand how Dhrupad and Khayal are at once so fundamentally similar, yet unique in the emotional appeal and atmosphere they elicit. 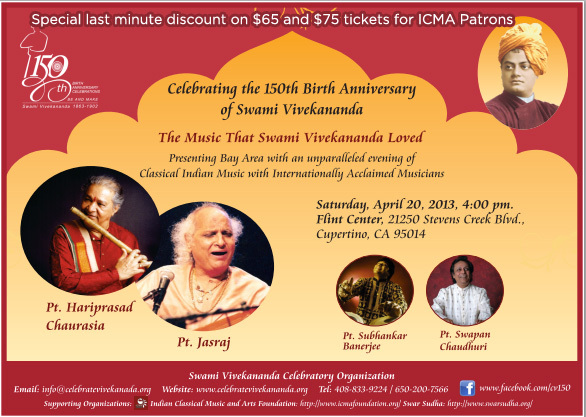 ICMA supported Swami Vivekananda 150th Anniversary Celebration event with Pt. Jasraj, Pt. Hariprasad Chaurasia, Pt. Swapan Chaudhuri, and Pt. Shubhankar Banerjee at Flint Center on April 20th! Special discount for ICMA Patrons: $10 discount off $75 ticket, and $7 discount off $65 ticket. The Indian Classical Music and Arts Foundation (ICMA Foundation) is a 501(c) (3) non-profit founded by Indian Classical vocalist Mahesh Kale with a vision to spread the magic of Indian classical music among global audiences, and share with them a slice of authentic Indian cultural heritage. We aim to achieve this through meticulously planned and executed concerts, workshops, lecture-demonstration sessions and artist interactions. Our mission is to preserve, nurture and celebrate Indian classical music through activities and projects aimed at exposing global audiences to this art form and aiding its sustainment through charitable initiatives. To know more about how you can get involved or support us, click here.